A large weather system is on its way to the Great Plains. In a day and a half we are predicted to get anywhere between 12 and 20 inches of snow, depending on which weather station we consult. Of course, the first priority in the face of weather alerts is to ensure the livestock have shelter and feed. 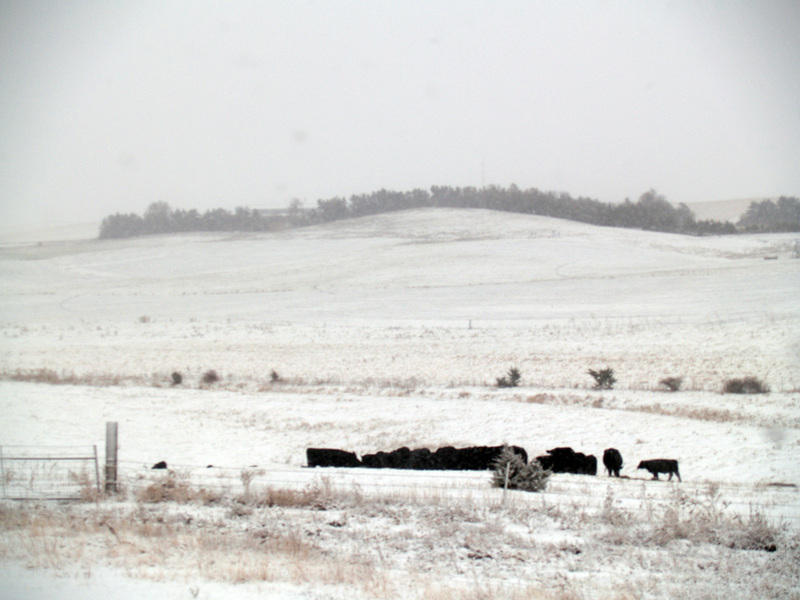 Our cows will be brought home and fed to help them ride out the storm. The chicken coop is undergoing cleaning with stockpiles of fresh hay and newspaper added to their nesting boxes and roosting shelves. A quick check of the dog and cat food supply showed it is almost gone, so tomorrow means a trip to the farm store for a couple bags of food. 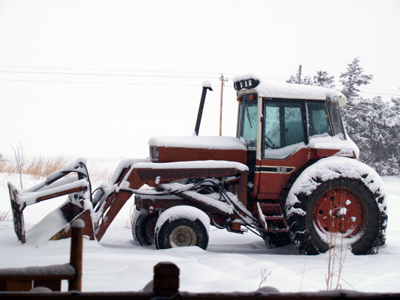 The tractor is also rather important during and after a snow storm to feed cattle and dig ourselves back toward civilization. With that in mind, hubby sent “Old Red” off to the shop yesterday for some overdue transmission repairs. He claims there is a worn-out whatchamacallit in there, but I know the truth….he is secretly going to make sure it finally has 3rd gear. This mysterious notch in the gear shift that makes those who dare approach it feel like they have been electrocuted because of the intense grinding will finally be tamed! I can hope, can’t I? Another storm preparation is to tempt puppy into using her dog house instead of sleeping on the deck in front of our patio door. I took some old, torn coats and blankets and lined her dog house. A couple hours later, I went out and retrieved all of them from where she scattered them across the lawn and put them back in the dog house. A few hours after that, I looked out to see the puppy sleeping on an old coat in the middle of the lawn and several cats sleeping on all the other rags she had scattered, again. At least she was halfway to the doghouse…. I also have to prepare for the possibility that we may be without electricity. Reminder from the last storm: Make sure everyone has a big pile of clean, dry socks before the electricity goes out. A washing machine full of water and socks is not useful during a power outage. There is a much longer ‘storm readiness’ list than this, but I need to get off the blog and get started on my checklist. I am sure many others have some great tips or stories related to getting ready for blizzards. What are yours? Wow, that is a lot of work. Hope the storm has passed and you weathered it ok. The storm has slowed down and hasn’t gotten here yet *sigh*. But they have reduced the amount of snow expected to around 6-8″. That should be much more manageable than 20″!